Ole Gunnar Solskjaer has already overcome a multitude of different challenges in his short time as Manchester United boss. He successfully restored an attacking mindset to the club, bringing out the best in key players like Paul Pogba and Marcus Rashford. He recorded impressive wins on the road against Tottenham, Chelsea and Arsenal and shut down Liverpool at Old Trafford. He also overcame a Kylian Mbappe-led Paris Saint-Germain, stunning the French champions in their own backyard with a 3-1 that put United in the Champions League last eight for the first time since 2014. And while the Norwegian has exceeded expectations to the point where he was on Thursday confirmed as United boss on a permanent basis, even he will require a bit of fortune to overcome the upcoming stretch. Now that the internationals are out of the way until the summer, Solskjaer enters a potentially make-or-break 30-day period which includes eight matches and featuring encounters with Manchester City, Chelsea and a two-legged quarter-final date with Barcelona. But it starts with Saturday’s visit of Watford to Old Trafford which is, strangely, United’s first league game in three weeks. The Hornets, chasing seventh in the Premier League as well as FA Cup glory, will provide a stern assessment of United’s injury-ravaged squad. Yes, Solskjaer, like in the games leading up to the international break, is likely to be without a clutch of regular first-teamers. Alexis Sanchez and Phil Jones are out while Eric Bailly, Anthony Martial, Romelu Lukaku and Marcus Rashford are all fighting to be fit for Saturday. Injuries have begun to pile up on Solskjaer and with several attack-minded players set to miss out this weekend, a greater emphasis will be placed on Paul Pogba. The Frenchman has been a standout performer under the former striker. Reinvigorated after moving past his much-publicised fallout with Mourinho, Pogba has nine goals and seven assists under Solskjaer. The 26-year-old will be key to United’s chances but he will face a robust adversary in compatriot Abdoulaye Doucoure, who has been one of Watford’s most consistent players this season. 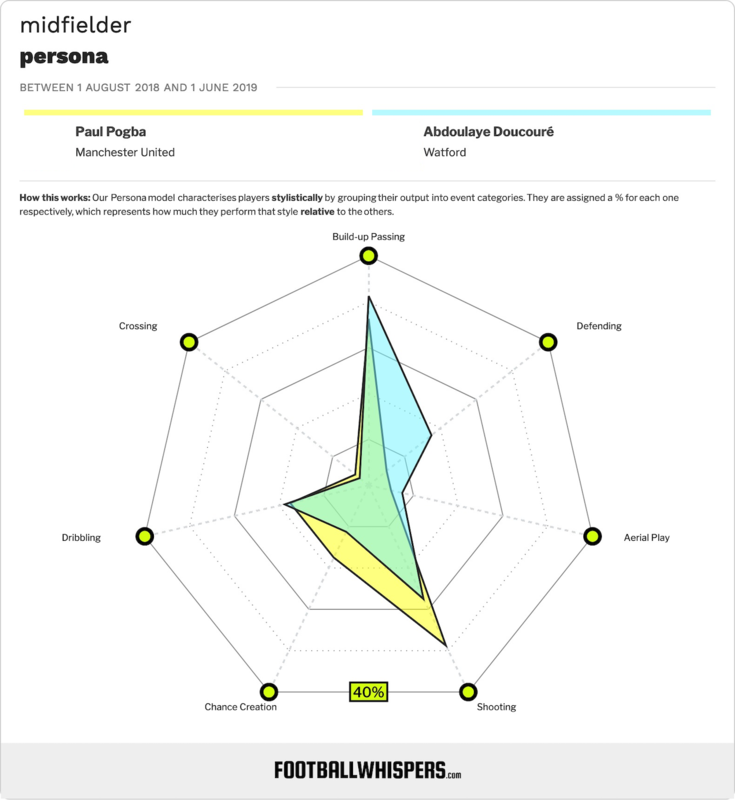 Pogba and Doucoure are important operators in midfield for their respective teams and, as you can see from their Football Whispers player personas, they are not too dissimilar. 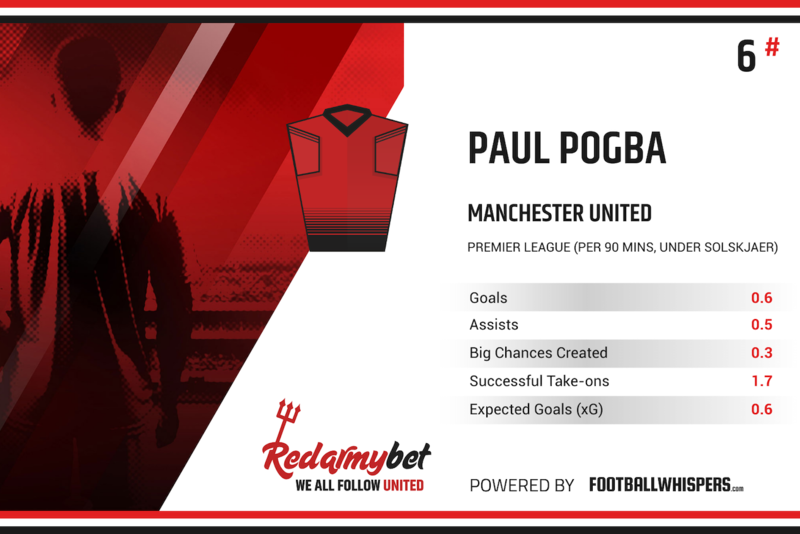 Both players are heavily involved in build-up passing and attempt roughly the same number of dribbles, but while Pogba excels more in chance creation and shooting, his fellow countryman is more versed in the defensive side of the game. This much is reflected in the stats. Doucoure averages more possession gains in the defensive and middle thirds than Pogba, lands more tackles and completes more interceptions. Meanwhile, Pogba, who has revelled in a more advanced berth in midfield during Solskjaer’s tenure, boasts 0.53 expected goals (xG) and 0.2 expected goals assisted (xA) compared to Doucoure’s 0.17 and 0.15 respectively. It’s unsurprising, then, that Pogba towers above Watford’s No.16 when it comes to both scoring and creating goals; Pogba’s 11 goals and nine assists comfortably surpass his counterpart’s three and six. 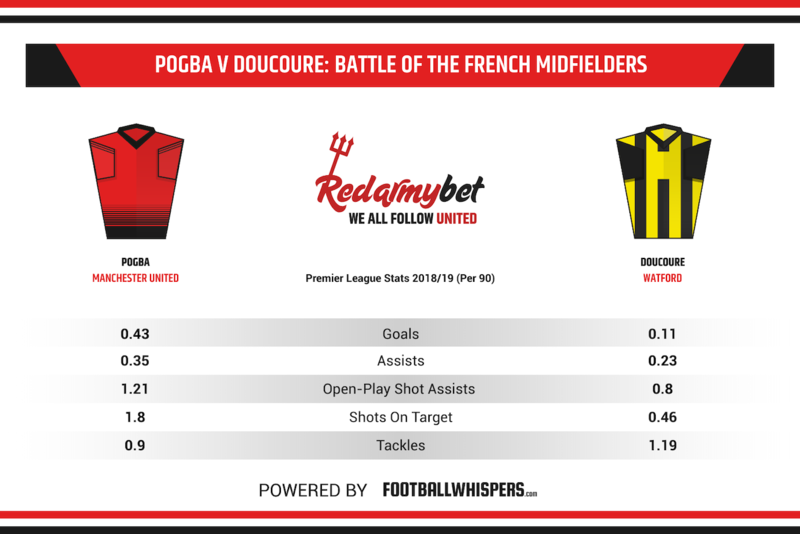 United fans are well acquainted with Pogba’s powers as a matchwinner but it would be perilous to discount Doucoure’s potential impact on the result here. In fact, he has a goal and an assist in his last three appearances against United, including a clever surge forward into space and cut-back for Andre Gray in September’s clash at Vicarage Road. He also struck an excellent consolation goal in United’s 4-2 win at the same venue last season. Suffice to say, the Red Devils should have him marked out as one of Javi Gracia’s main danger men. Whereas Etienne Capoue is expected to stay deep to crush United counter attacks, Doucoure will be more adventurous. United must watch his late runs into the box and his aerial prowess from set-pieces. It should be an intriguing battle. Pogba is enjoying an excellent season with United but Doucoure has the opportunity to show why Paris Saint-Germain have chased his signature in recent transfer windows. He can further enhance his reputation with a strong showing here while Pogba can cement his own status as Ole’s go-to guy with another dominant midfield display.